DeSoto Productions, located in Albuquerque, New Mexico, is a full-service CD and DVD duplication business. The company specializes in delivering to clients CDs and DVDs in retail-ready packaging in small quantities at an affordable price. 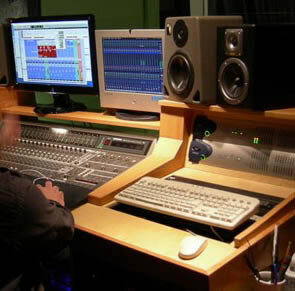 The company's founders opened a recording studio in Albuquerque in the early 1970s and for the past 35 years have produced and engineered music from all genres. Their expertise encompasses all facets of the recording studio business, and their experience ranges from playing live performances to producing and mastering major recording artists. DeSoto Productions employs the latest technological advancements, and stays on top of trends in the music and corporate industry. In the 1990s, when compact discs began replacing cassette tapes in the studio, the company envisioned providing a service to indie artists, who without the support of a major record label, still needed a professionally packaged product. DeSoto Productions' CD duplication services offer recording artists a means of distributing original music at an affordable price. Today, CDs are the media of choice as a means for transferring information and reaching audiences, not only recording artists, but also for businesses, churches, schools, government agencies, non-profit organizations, and special events. DeSoto Productions now offers DVD duplication for the latest sound, video, and information technology media on the market. Jorgie Winsberg, pictured above, joined the company in 1999. Clients find her creativity, communicative style, responsiveness, and expert knowledge of graphic design invaluable in planning and accomplishing their projects. She will collaborate with you to transform your ideas into a final product you will be delighted with. She provides customer service tailored to your specific needs, whether your project is already designed or is still only an idea. DeSoto Productions offers small and large customers quality services at affordable prices with a 100% satisfaction guarantee. Their staff is confident that you will be as pleased with their products and services as their hundreds of other clients have been.